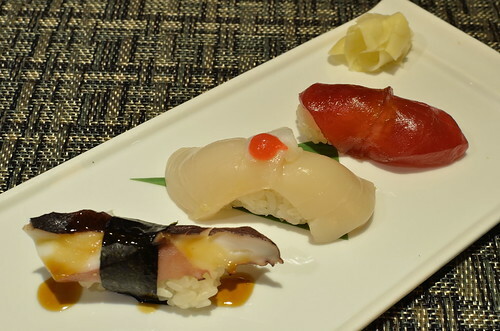 Recently, I wrote a review on Maruko Japanese Restaurant, a popular sushi restaurant located in Arlington, VA, as I am fond of good and fresh seafood prepared in the Japanese fashion. While I receive many internet coupons for various sushi restaurants, I pretty much delete them right away since sushi is one food item that I do not take chances with or play some form of culinary Russian Roulette. However, I snatched up an offer that appeared a few weeks back for a Kaiseki Tasting Menu, and I managed to experience it for the first time at Sushi Taro, a reputable traditional Japanese restaurant located in the Dupont Circle area of DC. Kaiseki is a traditional Japanese dinner that consists of numerous dishes that show off the cook’s refined culinary skills and the seasonality of the ingredients. It is an art form that balances the “taste, texture, appearance, and colors of food.” Beautiful dishes and bowls are chosen to present the small servings in order to complement and enhance the eating experience. Even leaves and flowers are added to imbue the sense of nature and its bounty. Each serving is self-contained in its theme and sensory evocations. I will present each course very much in a Zen mode – simple, direct and unadulterated. 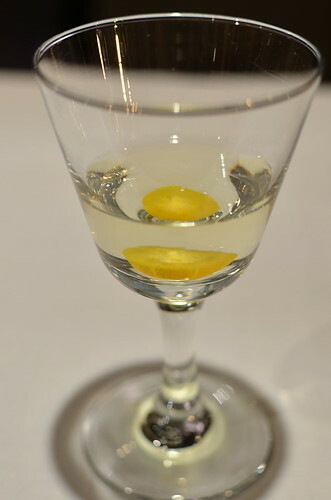 First Course – Aperitif: Sweet sake-like “Kinkan” wine with half of a sweet and citrus Kumquat as a chaser. 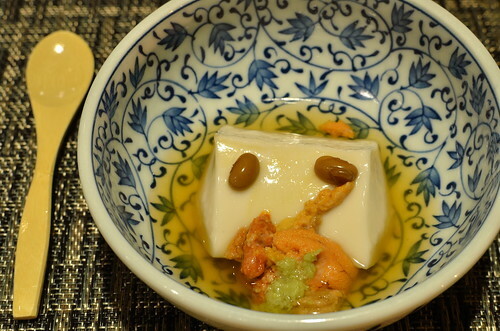 Second Course – Tsukidashi: Gelatinous “Goma” Tofu made from Sesame seeds paired with fermented Soy Beans and briny creamy Sea Urchin, swimming in a light Dashi broth. 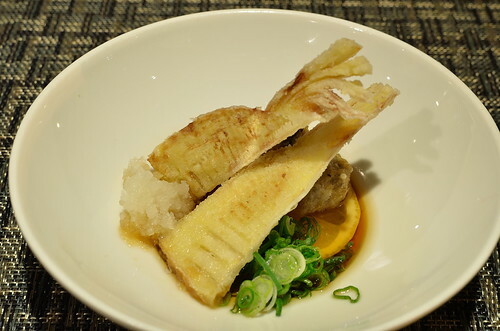 Third Course – Appe: Tender and crispy Bamboo Shoot Tempura and Lotus Root Dumpling (Agedashi) in a light soy sauce infused with a slice of Lemon. 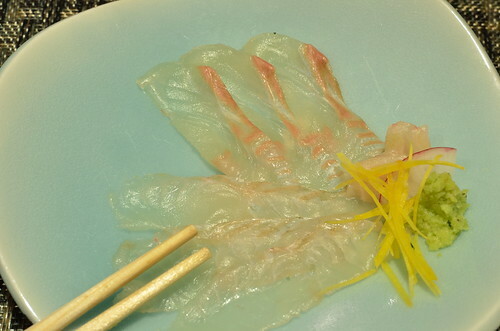 Fourth Course – Sashimi: Thin and mildly delicate slivers of Live Flounder (I assume the flounder was alive just before its filleting). 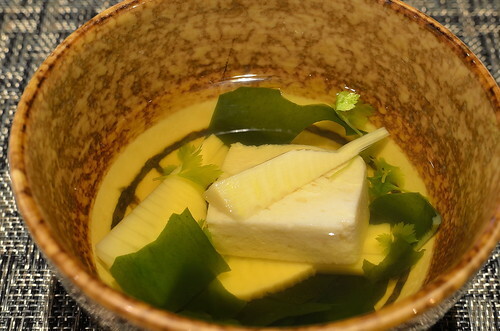 Fifth Course – Soup: Tender and crunchy “Wakatake” Bamboo shoots, Snapper Cake, and mineral-like fresh “Wakame” Seaweed in a light broth. 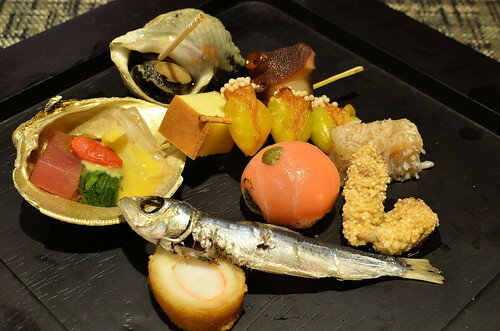 Sixth Course – Hassun: Battered Fish Cake, Grilled Fresh Anchovy, Fish Roe, Rice-stuffed Ginko Nuts, Smoked Salmon Ball, Crabmeat Jelly, braised Octopus Tentacle, Sweet Cake, Sea Snail, Tuna in Mayonnaise. Fresh and sweet treasures of the ocean. 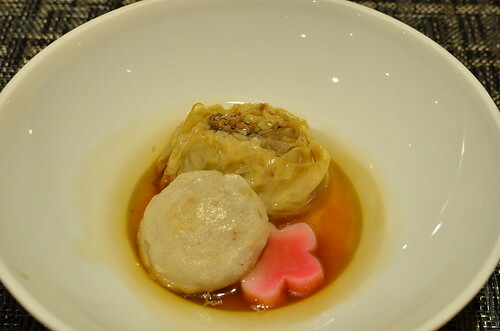 Seventh Course – Imobou: Salty shards of “Boudara” Dry Cod wrapped in smooth “Yuba” Soybean Skin paired with a soft and light Yam Dumpling in a light sweet sauce. 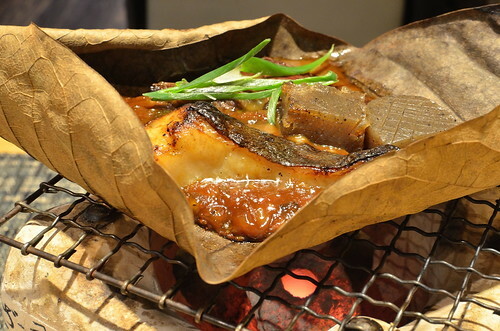 Eighth Course – Yakimono: Tender well-marbled Australian “Wagyu” beef, moist and flaky “Gindara” Black Cod, with chewy and gelatinous Konnyaku Starch bites, simmered in Red Miso on Magnolia Leaf and burning coals. Ninth Course – Sushi: Braised Octopus Tentacle, sweet tender raw Scallop, and soy-marinated raw Tuna. 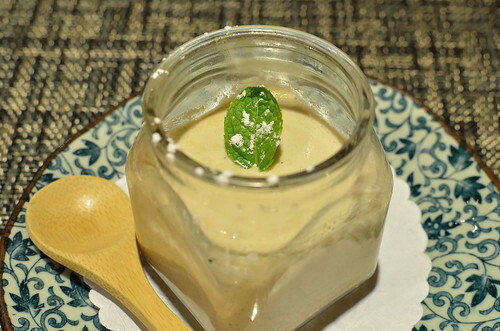 Tenth Course – Dessert: Green Tea “Hoji-cha” flan-like Pudding with a sweet-burnt Caramel Sauce. This write-up is not necessarily a review on the strengths or weakness of Sushi Taro Restaurant but more a recounting of a fantastic gourmand’s experience of a Japanese multi-course meal. If the refinement of this Kaiseki meal and the large presence of Japanese executives with their underlings in the restaurant are used as a barometer of the authenticity and skill level of the kitchen, I will be back in the future to sample its regular fare, beyond the $80-per-person menu (before the 50% coupon – thank Buddha for it) that I savored with true delight. Another Oishi exclamation here. I enjoy your blog and live vicariously through your food blogging, but the 2nd and 6th course of this meal doesn’t look appealing…not at all. LOL. It’s an Asian thing. Yes, the Sea Urchin in the 2nd and Tofu skin in the 6th have a “slimey” look to them, but they tasted great! Well, I guess the proof is in the pudding or tasting.